Following the success of the Rock Star birthday card made a couple of weeks ago, I have been asked to make a birthday card for a female Osteopath. I will admit I struggled a bit to begin with, but I eventually came up with an idea. I used some lovely DCWV pastel stripey card and matted it onto basic 8 x 8 white card stock. 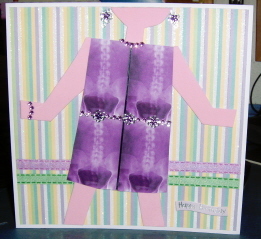 I used a (slightly enlarged) template from issue number 82 of Papercraft Inspirations and cut out the shape of a woman and dress in scrap card. I then cut out shapes from pink foam to make the arms, legs and head and glued these to the template I had already prepared. I was lucky enough to come across a picture on the web of some purple spines (which I thought might be appropriate for an osteopath), so I printed off a copy of the picture, cut out the dress shape and then glued this onto the template. Purple adhesive gems were used to create a bracelet and necklace. A strip of small silver adhesive floral borders were used to fashion a belt and matching earings. Purple adhesive gems were also attached as accents. The card was finished off by adding a Happy Birthday sentiment.